Four years ago, my husband and I were living in a large home with loads of stuff all around us. We had a toddler, a low income and a large mortgage payment (relative to the income, anyways). Our house was damaged in an earthquake and we were unable to renovate it until we had a clear idea of what our insurance company intended to do with our home. There was a high chance they would demolish it, in which case any money spent on renovations or improvements would be money down the drain. So we made do. With gaping cracks in the foundation of our house, plaster cracks from every window and door frame and floors that sloped so severely my son’s ball would roll into one corner of the room. It was not a pleasant time. We were supposed to be living the dream. Of course, we hadn’t bargained on an earthquake, but nevertheless, the dream felt more like a burden every day. The high mortgage payment took up nearly half of our income, with the rest eaten by essential (but boring) life costs. There was little to spare for retirement savings and funding a healthy travel stash. As our disdain for living in a large and expensive home grew, so did our desire for a simpler life. More particularly, one lived out of a backpack/suitcase hybrid we nabbed in the Christmas sales. We wanted to travel, to escape the burden of our too-large-for-us home and see how we went living with only the things we could carry. At the time of our escape plan, we had some money leftover from our pre-kids days (we had saved one income and lived on the other whilst enjoying DINK life) that was earmarked for renovations. The rental market was booming due to a shortage of homes (over 6000 homes were lost to earthquake damage). We knew that renting out our house would cover our costs and we could travel frugally off of savings for some time. The plan was in motion. To rent out our home, it needed to be completely empty. This meant finally tackling the boxes and boxes of junk we’d hauled across God’s green earth with us. We’d stored junk in my parent’s garage, shipped boxes full of ornaments and trinkets from travels in South America and had international movers bring across what was left of our life in Australia. I’d also ‘saved money’ by buying things I thought we needed online and having them sent to my parent’s house before we moved into our own home. There was no end to the stuff. Most of the boxes were unopened. We didn’t consult any blogs or books because back then, they weren’t common. Most people didn’t get rid of most of their stuff so they could travel the world with a young child. Those that did tended to be nomadic, or selling their home with no return in sight. We knew we’d need to return eventually, so we had to be strategic with what we kept and what we got rid of. We used the following steps to get rid of half our stuff, so we could rent out our house. I bet if you took a look around a cluttered room right now you could easily find 10 things to part with (unless you’re a hoarder, that is). This task gets harder as you get better at decluttering, but initially just standing in a room full of stuff (we used our second bedroom as storage for boxes) with the INTENTION of getting rid of the stuff means quick results. Just setting aside the time to sort everything into what to toss and what to keep piles made the task easier. We had a flight to board on May 4th, so we knew we had to get everything sorted at least a couple days before that. The easy and obvious things to get rid of included old stationery items, clothes we never wore, old toiletries and excessive kitchen items. 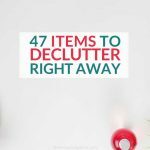 For more easy and obvious items to declutter, have a read of this 47 things to declutter without guilt. Throughout the sorting process, we were acutely aware of the items that held value and those that weren’t worth selling. Money was tight back then so everything worth a few bucks went in the ‘to sell’ pile. I packaged up piles of real estate investing books and sold 10 books for $40 to a wannabe investor, rather than try to sell each book at $2-$5 each. I did the same with college textbooks, offering out of date editions as reference material and background reading for certain subjects. If you want to figure out what things are truly important to you, packing up your life into a storage container is an effective tactic. When you have to fit everything you WANT TO KEEP into 2m by 4m, you become quite ruthless. The things that we knew we didn’t need anymore were given away. This included a set-top box, DVD player, a set of plates and bowls we’d never used. Since we believed we would be returning to our life after our overseas sojourn, we kept the washing machine, fridge freezer and even our car in storage. Space was made for other useful and expensive-to-buy-again things. Once the storage unit was packed, the tenants were in our house and we were on a plane across the Pacific, the lightness was almost overwhelming. We instantly felt better, and what proceeded were the happiest 15 months of our lives as we flew from New Zealand to San Francisco, then to Mexico. Europe followed, where we planted ourselves in a tiny Spanish apartment for six months while trying to immerse our toddler in the language we both adored. I loved living in Europe with it’s lovely, small houses. In Spain, we found out we were to become a four-person family. We were delighted, but also sad at needing to leave the place we had come to love so intensely. One thing was very certain. We were not going to be resuming our old life as if nothing had changed. Most mornings, after we dropped our son at his escuela in Spain, my husband and I would head to a cafe to start the day as the Spanish do – with a cafe con leche. Many coffees later, we figured out we wanted to continue to travel extensively, even with two kids (yes, we’re insane). But desire and ability are two very different things. We wanted to travel, but we sure couldn’t afford it if life was going to be the same as it had been before we left. The savings from our cashed up DINK days were almost gone, and with another kid on the way, our earning capacity was severely limited. Earning more money was not an option. We’d simply have to spend less. But we were already frugal, lived within our means and our expenses were pretty low relative to most people our age. A drastic action was needed. Our largest expense was the house, and we’d lose the rental income if we moved back in, so all the expenses were on us. There was another, counter-intuitive solution to our problem. We owned a rental property, a small unit (flat or duplex, maybe even a townhouse, depending on where you’re from) that was rented to a couple. We’d purchased it just before I resigned from my job to go travelling, as we were quite sure the banks wouldn’t lend money to us again. The monthly payment was $500 cheaper, and it was in a better area for employment prospects. The backyard was fully fenced and big for a small house (having a big yard makes all the difference). But it had two bedrooms, one bathroom and no garage. And we were about to have another baby. Plus we had that storage unit full of stuff! I mulled over the idea for weeks. Until I settled on a decision (and then convinced my husband). We’d lived in our tiny Spanish apartment very happily, and the new place was slightly bigger. The money we’d save would more than cover any improvements we’d want to make. The small house would be easier to renovate, and more attractive to Airbnb guests (we hoped to host to offset the cost of our own travel). We were going to try small home living. After we arrived back and visited our new small home, our hopes were dashed. It was dingy, dark, freezing cold and had the world’s oldest cooker (which we’ve since updated). Never mind that we’d been broken into and some POS had stolen our hot water heater and taps – for scrap metal – in the time between our tenants vacating and us moving in. Due to the robbery, we were stuck at my parent’s house for longer than expected. The side benefit was we could take our time decluttering from the storage unit without bringing everything to the small house. I’ve gotta tell ya, the ease of decluttering from a space AWAY from home is huge. Standing inside a cold cinder block storage unit, all of a sudden emotional decisions become easier to make. When your stuff isn’t in a familiar environment, it feels less sentimental and more of a burden. We used the time lag in getting our hot water operational to paint and carpet the space. White walls, dark grey carpet. It was very minimalist but felt larger and less depressing than we’d found it. We used some old pallets to make a bookcase and invested in smart toy storage. Then, we started bringing the boxes in. As we started to fill the 860 square feet of living space we were now committed to, reality hit fast. There was too much stuff and no storage space. We had space for the essentials (clothes we actually wore, towels, bedding, kitchen gear) and nothing more. The baby crib was taken apart and put in the shed. Boxes of toys were donated without even being opened. We allocated a corner of the living room as the ‘toy corner’ and that was that. 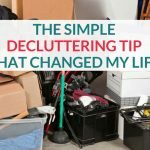 I decluttered items based on my goals method. It worked better for me, than sparking joy. I took brief glances at the bags of clothes I’d had stored for over a year before donating them en masse. We kept the storage unit for the full month we’d paid for, and decluttered from there. Not allowing the items into our home in the first place meant we couldn’t become sentimental and change our minds. 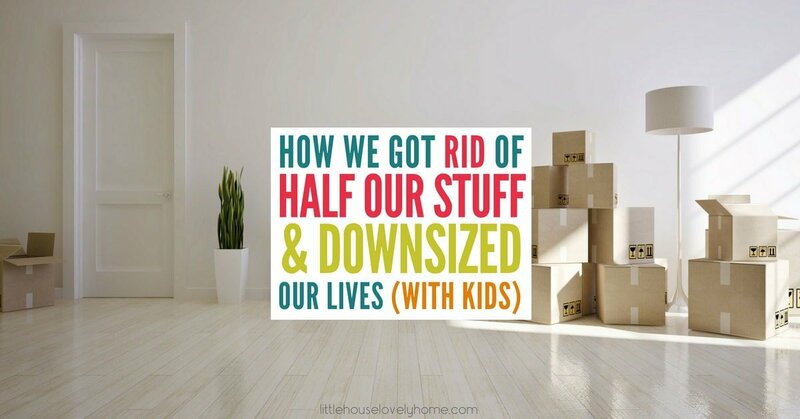 Practicality was the focus, we made space for the things we needed, then we got rid of the things that didn’t fit our house (or our new downsized lives). Downsizing and decluttering our space to make it right for us is a work in progress. We are still perfecting our home, making tweaks to future-proof the space. What has helped immensely when the going gets tough is keeping our ‘why’ front of mind. When the baby was 16 months old, we took our first round-the-world trip as a family. 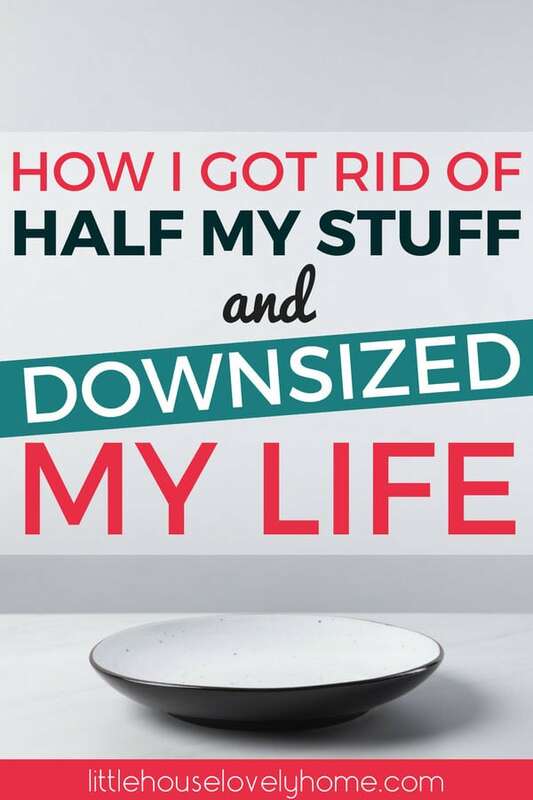 Downsizing gave us the money to do that. Downsizing meant we could manage our payment while we were away without needing to rent out the house (we used house sitters). Downsizing means we have now paid off our mortgage and can save for more adventures in the future. 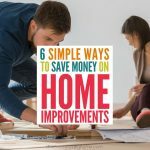 I’d be lying if I said I didn’t have concerns about how our small home will work when the kids get older, and I’m working on those solutions now (I promise to update this post when I write more on that). With that said, going smaller has enabled us to live a life we could never have achieved had we stayed on the ‘normal’ people path in our big and expensive house. We may have downsized our house, but we have definitely upsized our lives and I recommend others to think about doing the same if they are faced with similar situations.